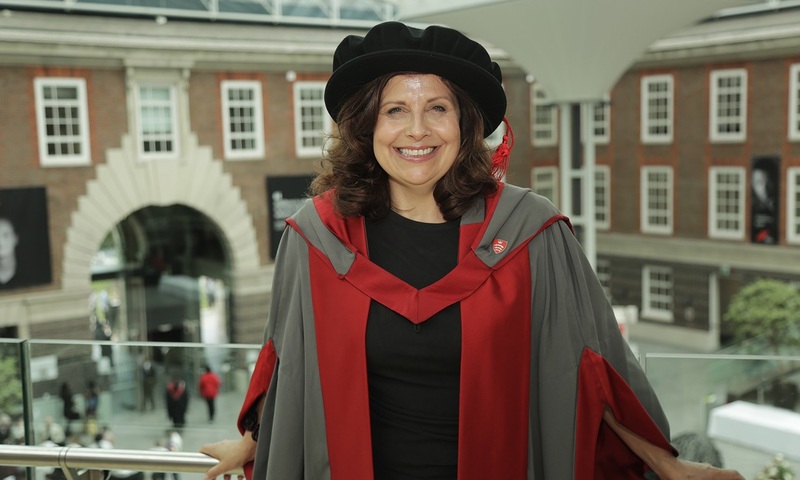 Rebecca Front, who played Nicola Murray in the awarded winning BBC political satire, The Thick of It, has been awarded an honorary degree by Middlesex University. Rebecca won a BAFTA and a British Comedy Award for her role in The Thick of It. She has also appeared in other dramas and comedies including War and Peace, Doctor Thorne, Human and Doctor Who. Her film work includes the latest Transformers and Down a Dark Hall and she regularly appears on BBC Radio 4. Her first book, Curious, published by Orion, was nominated for a National Book Award in 2015. On being awarded an honorary degree Rebecca was delighted. "This is a huge honour and I would like to thank Middlesex University for awarding me an honorary doctorate. I consider myself very fortunate to do a job I love. Something like this is the icing on the cake." Professor Tim Blackman, Vice-Chancellor of Middlesex University, is happy to be acknowledging Rebecca's work.